Think beyond loans - It might be tempting to turn to student loans to pay off the $40k per year it could cost for graduate school, but there are many options that don’t require you to pay back your lenders. Company sponsorships – Many firms are eager for their employees to become better educated, and they will often help fund graduate school. In exchange, they’ll probably require a pre- and post-graduate school employment commitment to the firm. FASFA grants - Federal and state governments distribute grants to students, based entirely on need. best of all, they don’t have to be repaid. All that is required is filling out the FASFA online application. Scholarships – National scholarships are need- and merit-based, irrespective of the school you’re attending. Individual schools also provide funding for students. Check out FastWeb and FindTuition for national scholarships. To find school scholarships, sign up for department newsletters, visit department offices, and check school websites. Fellowships and assistantships - Fellowships cover tuition and offer a monthly stipend and health insurance. Assistantships give you the same benefits in exchange for help with research or teaching a class. Find these the same way you find scholarships. One year of graduate studies at a private university can cost over $40,000. Because attending a university in a “prostitution-friendly” state like Nevada isn’t for everyone (though I’ve heard UNLV has an excellent MBA program), you’re probably going to have to look elsewhere to foot the bill. Fortunately, there are many resources to subsidize another few years of schooling. Finding programs and ways to get money takes some research, and filling out applications takes some time, so try to avoid putting this stuff off until the last minute. Securing a master’s degree does not require quitting your jobs and moving back into the dorms. Companies are eager for their staffs to become better educated, and they will often contribute a portion—if not all—of your tuition payment. Business-related fields (business, marketing, etc.) are the most common sources of employer-subsidized education. Architecture, engineering, journalism, and science firms also offer continuing education expense reimbursement. Some programs allow you to both work and go to school part-time, while others allow a full-time leave of absence from the office. This is clearly a huge investment for your company, so they’ll understandably want to see a significant commitment from you before they start signing checks. A good rule of thumb is to wait a year before submitting this kind of request. This year of hard work lets your employer see your dedication to the company and your capacity for improvement. In exchange for this subsidy, employers will want you to agree to stay with the company for several years (usually a minimum of five). There are other benefits of working for a bit before jumping directly into a master’s program: you build up a savings cushion, make sure you’re in the right profession, and give yourself time to really decide whether more education is in your best interest. Making the wrong decision about going back to graduate school is one of the biggest mistakes—both personally and financially—that you can make. If your employer does subsidize further education, there are several questions you need answered: Will they pay initial costs, or reimburse you? What are the dollar limits? Will low grades affect your reimbursement? Those of you with an affinity for earth tones and short haircuts may want to consider the military. The Military's Tuition Assistance Program is significant, but it’s clearly not for everyone. Now that you’re poor and don’t have to list mom and dad’s income when filling out your FAFSA (Free Application for Federal Student Aid), you may finally be offered something besides a couple of mediocre loans. Federal and state governments distribute grants, each worth thousands of dollars, to students based entirely on need. Unlike government-subsidized loans, you do not need to pay these funds back. All you need to do is fill out your FAFSA on-line—which involves answering a bunch of questions about our income and savings—then wait and see what Uncle Sam kicks your way. Unlike scholarships, there is no real application process for government grants. Completing a FAFSA also makes you eligible for several federal loans, and is used by schools in awarding basic work-study positions. Navigating the scholarship maze can be trickier than Sunday’s New York Times crossword. There are two basic types: national awards (both need- and merit-based), and university-specific awards. The great thing about national awards is that you don’t need to know what school you want to go to before applying. FastWeb and FindTuition are two great places for you to start your national scholarship exploration—just create an account to get started. A basic search turns up hundreds of scholarships, at which point it’s just a matter of deciding which to pursue. When choosing which scholarships to pursue, pick those that cater to your strengths and background. If you’re Hispanic, go after scholarships for Latinos. If you have a writing talent, enter some essay contests. If you’re getting your masters in nursing, apply for a nursing-specific award. It can be a jungle out there, but a more targeted approach gives you a better chance of hitting the jackpot. The requirements of every award are different, but most scholarships on FastWeb will have a website where you can download an application. These always include questions about your education, personal history, and your goals for the future. Filling out a scholarship application is just like applying for grad school; they want to know what makes you unique. After you’ve decided on a university, your next step is to apply for scholarships offered through the school. These are different from national awards, insofar as only students attending the college are eligible. Signing up for department newsletters, visiting their offices, and checking websites clue will help you stay abreast of what’s available. Some scholarships are open to all degrees, while others are specific to one area of study. Fields with the most available are music and art, business, and nursing. Filling out the application, gathering letters of recommendation, and nailing a personal statement can all be tricky. Enlist the help of friends and former instructors. They should be more than happy to lend a hand. The Holy Grail of graduate school financial aid are fellowships and assistantships. Fellowships cover your tuition—and often a monthly stipend and health insurance—allowing you to focus on your area of research. Assistantships (and work-study positions), on the other hand, offer the same benefits, in exchange for your help with research or teaching a class. (Note: If you end up going to the same university for grad school as you did for undergrad, the ties you established with your professors can result in choice research and teaching positions.) Not all positions cover 100% of tuition, but 50% is usually the minimum. The two scholarship websites listed above also list national fellowships, but department offices are a better place to start. Due to their large endowments, private universities offer an especially large number of awards. In general, the sciences (biology, chemistry, etc. ), and technical fields like architecture and engineering offer some of the most lucrative fellowships. A friend of mine studying biology receives a monthly stipend (plus free tuition) that would be a decent starting salary in some industries. Mechanical engineering grad students rarely need to pay a cent, and those studying computer science are often given free laptops and subscriptions to PC World. Needless to say, competition for the most prestigious fellowships is insanely competitive. Fellowships and assistantships are easiest to acquire once you’ve decided what school you’ll be attending for your graduate education. Every school offers different positions. Visit the department offices of your chosen university and ask counselors the exact positions your school offers. This early inquiry shows department heads just how serious you are about obtaining a position. The application process will likely include a written application, and possibly a series of interviews (often in front of a committee). 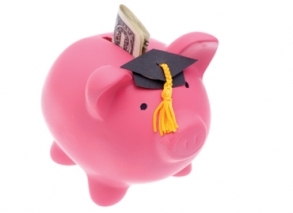 Student loans are a helpful last resort for filling that final funding gap. The federal government offers several such loans, but most states offer better rates. Finding the lowest rate can save you thousands of dollars over the years, so start shopping around early. Then, when you get that diploma, you can start figuring out how to pay it back. I don't know if this is a secret or not (I went on a few dates with an law school admissions counselor), but if you get offered a scholarship to a grad school that is only guaranteed if you maintain a certain GPA, you can often negotiate with the school to gaurantee all three years if you agree to attend. While I am sure this wont work with schools like Columbia or NYU who few would turn down, but many of the second tier schools would love to give an over qualified applicant three years worth of school to get you to go.